Shohei Otani has proven this season that he’s a talent unlike any other Japanese baseball has seen over the course of a full season. There are better hitters and better pitchers (though maybe not for long), but no one who can do both simultaneously as well as Otani has for the Hokkaido Nippon Ham Fighters this year. Considering just how well he’s done, that statement might stretch across the ocean to the major leagues as well. Otani the hitter has a .283 average, 26 extra-base hits (including 10 home runs), 31 RBIs and a .869 on-base plus slugging percentage in 191 at-bats. Otani the pitcher is 10-4 with a 2.46 ERA in 21 starts and has struck out 162 in 139 innings. 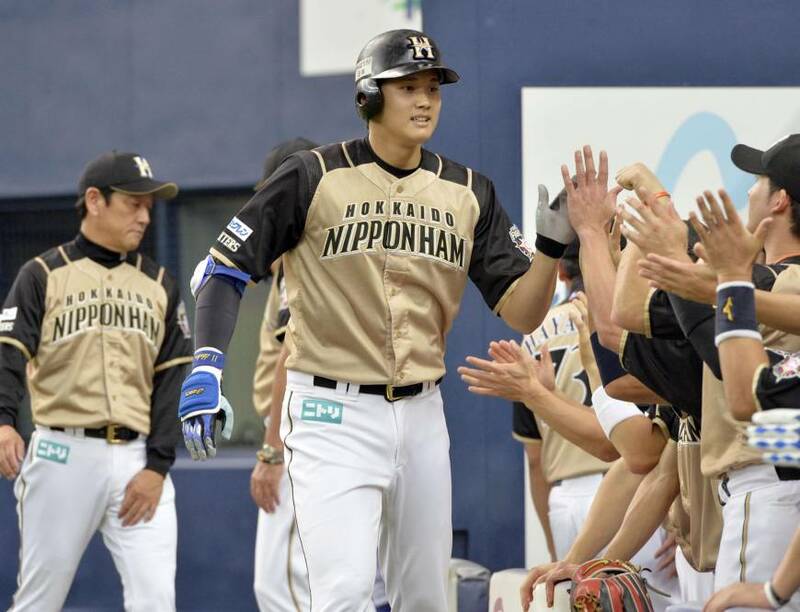 On Sunday against the Orix Buffaloes, he homered to straightaway center at Kyocera Dome to become the first Japanese player to reach double digits in both home runs and wins. The feat conjures up memories of the legendary Babe Ruth, who had 13 wins and 11 home runs for the 1918 Boston Red Sox in MLB. He’s a unique talent. One who during the postseason might provide Fighters manager Hideki Kuriyama with a unique dilemma deciding what to do when his best pitcher and a valuable offensive weapon (and a capable outfielder with a strong arm at that) are the same person. The season is in the stretch run. 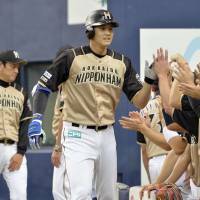 At present, Nippon Ham is more or less locked into the third spot in the Pacific League. The team entered Monday nine games behind the second-place Buffaloes. They’re mathematically still in it, but unless Orix goes into a prolonged slide, there probably aren’t enough games left to make up that ground. On the bright side, the same can be said of the Fighters’ own 7½-game advantage over the fourth-place Chiba Lotte Marines. Assuming everything holds, Nippon Ham would face the Buffaloes in the first stage of the Climax Series, with Orix hosting the entire three-game set. There would then be, in all likelihood, a showdown against Buffaloes ace Chihiro Kaneko, who through Monday was 12-5 and led the PL in both ERA (1.98) and strikeouts (181), in Game 1, and possibly Yuki Nishi (12-8, 3.01) in Game 2. It makes sense that the Fighters would put Otani on the mound in a game where runs could be at a premium. Doing that, however, takes away a good bat in a game featuring one of NPB’s best pitchers. If Otani were to pitch and lose that first game, things would get really interesting. The team has generally given Otani the next day or two off after starts before plugging him back into the lineup. That, however, is during the regular season where there are lots. Things change in the playoffs. A loss would put the Fighters in an elimination game with Otani potentially sitting on the bench. The Fighters could absorb a Game 2 loss if Otani were to win our hypothetical Game 1 and have him back in the lineup for Game 3. It’s at the same time an enviable and unenviable position for Kuriyama. Fellow players, fans and scouts have opined on whether Otani is more valuable as a pitcher or hitter for the better part to two years now. Is Otani a good enough pitcher that’s it’s worth losing his bat at times during the postseason (especially after losses)? Conversely, is he a valuable enough hitter — that is, does Nippon Ham have a replacement who can be nearly as good when it’s do-or-die time — that you risk losing him as a pitcher? Pitching and defense win championships, but only if you score a few runs somewhere along the way. Otani is too good to not have him on the mound, but he’s not too bad with a bat either. Nippon Ham should probably roll the dice with him as a pitcher, but it’ll be interesting to see how they play it.